Using private/incognito browsers to test out your app designs or just to take a peak. There are a couple reasons why GrooveJar’s pop-ups may stop showing up on your website. The most common reason would be that you’re not testing the application out on a Private Browser or Incognito Mode. The reason behind this, is so that returning visitors or customers who land on your site isn’t bombarded each time. It’s not a pleasant user experience. So, don’t fret that GrooveJar isn’t working – always test using one of the 3 major browsers GrooveJar supports: Apple Safari, Mozilla Firefox, and Google Chrome. Another reason why GrooveJar may not be popping up/showing up is when your billing information is not up to date. To enter private browsing using Apple Safari, go to File > New Private Window. To enter private browsing using Google Chrome, go to Menu Icon > New Incognito Window. 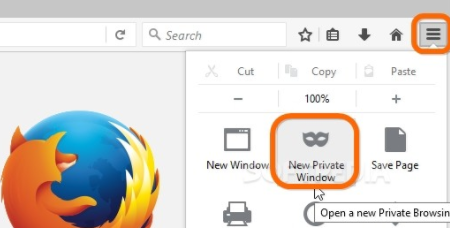 To enter private browsing using Mozilla Firefox, go to Menu Icon > New Private Window.